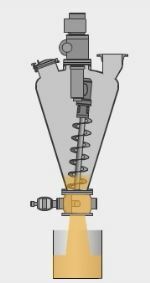 BOLZ-SUMMIX conical screw mixers and dryers work according to the proven principle of a rotating mixing screw being guided along the wall of the conical vessel at constant close distance by means of an orbital arm. 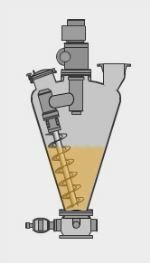 The mixing screw moves through the product and transports it from the bottom of the vessel towards to top. The product is constantly moved upwards along the container wall by the Archimedes-Screw principle. At the same time gravity pulls the product down along the opposite wall and in the centre, outside the effective range of the mixing screw (convective gravity mixing).. As the rotating orbit arm guides the mixing screw along the wall, a slightly horizontal force results, and thus three-dimensional product flow, giving intense yet gentle mixing. The gentle mixing is maintained by a displacement of particles against each other by lifting of product by the mixing screw, the imbalanced continuous descending of product in the centre by gravity and the slow radial orbital movement of the arm. As only a selected, part of the entire batch is mechanically agitated and lifted by the mixing screw, shear applied to the product particles, the resulting wear and attrition, as well as finally the drive power required, are comparatively low and energy saving. 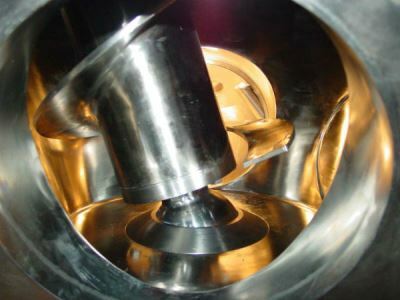 Initial product and solid ingredients are filled into the conical screw mixer mainly by gravity. The feed rate nay be controlled by load cells or product may be dosed using typical feed equipment. Liquid additives may be sprayed into the mixer by jet nozzles or may be sucked into the process. 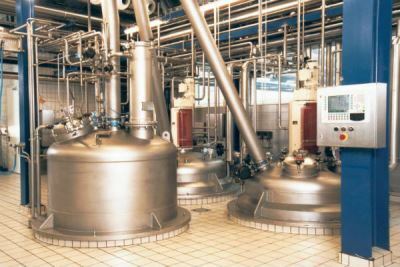 All products introduced into the conical mixer will be gently agitated and circulated by the mixing screw guided close along the vessel wall by the orbit arm, which will maintain a gentle and homogeneous mixing of all ingredients. This in a product and energy saving way without wear and attrition, product destruction or heat input into the batch. Mixers can additionally be designed with heating or cooling jackets. 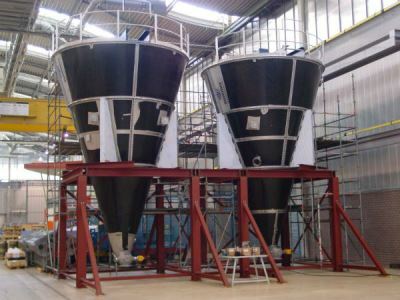 The homogeneous blended final product is discharged via the bottom discharge valve into a bin, container or conveying system by gravity, assisted by agitation of the screw and arm without leaving residues at a high yield. 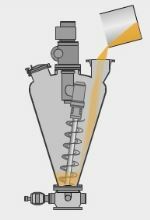 For cleaning the equipment internals between individual batches, or before product change, fix welded spray nozzles will spray cleaning fluid to the entire inner mixer surfaces. All product exposed or contaminated parts are wetted, washed down and rinsed with cleaning liquid or water. This guaranties an efficient total cleaning of the fully contained mixer internals. 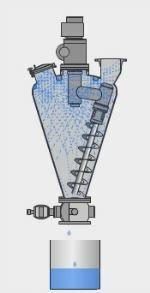 A self-supporting mixing screw without lower bearing, with unimpeded, free, central product discharge for optimisation of residue-free discharge with an homogeneous and controllable product flow.